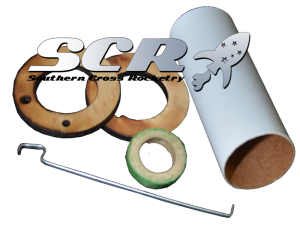 Motor Mount Kits contain the various components to centralise and secure rocket motors. Check the dimensions of the desired motor and body tube to see which kit is required. Available in a range of internationally recognised sizes, motor tubes are manufactured using a spiral wound technique with strict tolerances to ensure there is no lateral seam. Centering rings are made from premium plywoodand are precision cut on our in house laser cutter.